Ellms’ Christmas Trees is a family-run Christmas tree farm near Saratoga at the Ellms Farms which began about 30 years ago when the first field was planted. The farm consists of 200 acres of ponds, forests and Christmas tree fields. We invite you to come and enjoy the picturesque scenery at this festive time of the year! For those interested, we are DOG FRIENDLY IF you have a FRIENDLY DOG! We look forward to your visit and hope you will make us part of your holiday traditions! 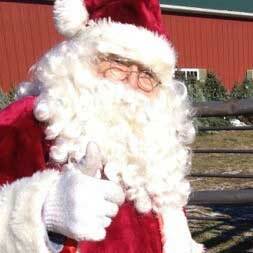 Santa will be visiting the Farm! Saturday and Sunday, December 1,2,8,9, 10:30 A.M.- 3:00 P.M.
Complimentary hot chocolate for the family!